There’s a rumbly in my tummy for treats! Too cute. Happy Halloween right back at ya! Wow! This looks really professional! Could be a commercial or something! Happy WW! Winnie The Pooh..Winnie The Pooh huggable snuggable winnie the pooh….love it. thanks for sharing..happy ww. Bet she likes Bit O’ Honey best! What a cute costume. Just precious! Aww! She makes an adorable Pooh! Great pictures! Have a great Halloween! I posted my Wordless Wednesday also!!!!!!!!!!! that is so adorable!! Have a wonderful day. How cute!!! my son was pooh last year! 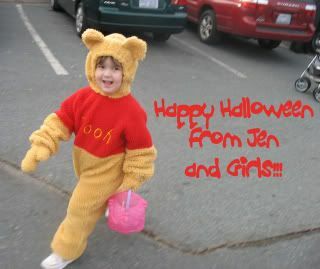 Wish that little pooh bear was knocking on my door tonight! Too cute! Winnie the Pooh is my fave!